CLYBOURNE PARK is one of the most acclaimed plays in recent times, and with good reason. It tackles issues of race, gender, war, and suicide and does so with a unique sense of humor and a lot of heart. I had completely different expectations from the show; I think I was expecting something like Archie-Bunker-meets-Goodtimes, but instead what was presented was a well-written and well acted creative and entertaining two-act play. Act One is set in 1959 and as soon as the show opens there is tension in the air. The dialogue started slow but set the tone for an underlying anxiety that had me on the edge of my seat more than a few times. I was especially taken with the work of Diedre Madigan (in both acts) and was moved to tears by the work of Wilbur Edwin Henry in Act One. Madigan played the typical 50’s woman, overwrought but keeping up the image of strength required of a proper housewife. In Act Two, she nailed the tough-as-nails middle aged professional woman who was just a little detached from the real world around her. I feel sorry for the people on the other side of the theater who she had her back to for much of Act Two because I thought she was absolutely dynamite but I’m not sure they could see all the facial expressions she was giving. Without giving away any of the delicious but very sad plot points, I found Henry’s meltdown to be realistic and emotional but it was his quiet restraint up to that point that reminded me of many men of his era that I’ve known who were not afraid of confrontation but polite enough to avoid it as much as possible . . . until they are pushed to their breaking point. There were several great laughs, but what was perhaps the most striking to me were the awkward groans and gasps from the audience. The young woman seated next to me actually hid inside her sweater at one point because of the uncomfortable direction the discussion on stage was taking. Any reaction is good, I’ve heard said, and I think these reactions were very very good. If I had any complaints, it was that the staging made it difficult to hear (for some of the older patrons in my section) and hard to see because several actors and their backs to me for much of the show. The same would be true for those seated on the opposite side of the theater. However, I still was able to feel the tension they built regardless of not having an idea seat. I highly recommend you see this new contemporary work. I think it will become a classic, because while the themes and issues are timely they are also timeless. 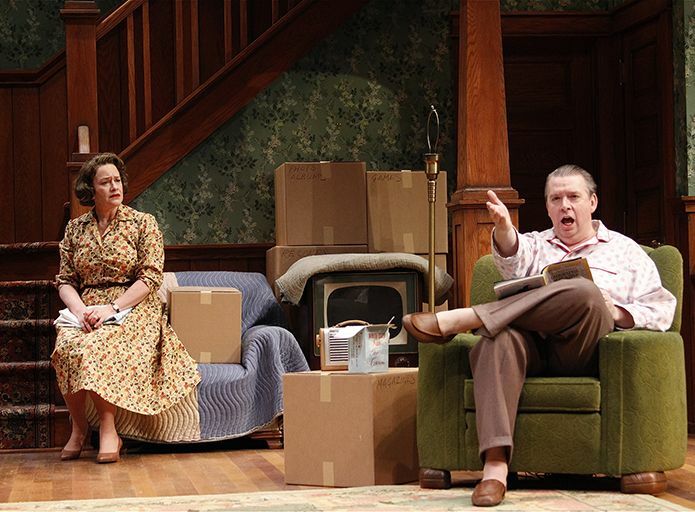 CLYBOURNE PARK runs at the Cincinnati Playhouse in the Park through February 16th.